From the creator of The Gods Must Be Crazy. Away in their own mysterious world, far from the prying eyes of people, Africa's animals lead lives of humor and horror, danger and dignity. One scene depicts baboons, elephants, giraffes, warthogs and other animals eating rotten, fermented fruit of the Marula tree. The intoxicated animals then stagger around to comic effect. In the morning, we see one baboon wake up, disheveled, next to a warthog, and quietly exit the burrow, as not to wake her. Some experts have claimed that some scenes were likely staged; elephants would be too large, for example, and drink too much water (diluting the alcohol) to get intoxicated. 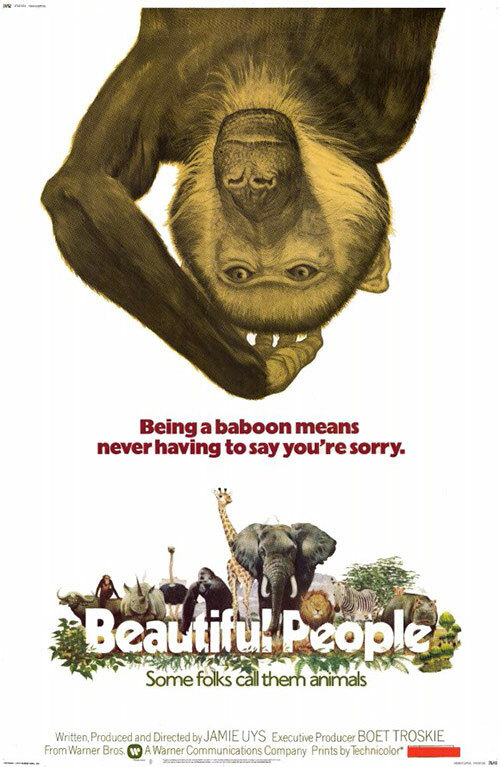 0 Response to "Animals Are Beautiful People (1974) Jamie Uys"